Janet is Natural and Cultural Resources Program Manager for the Arizona Army National Guard and has worked for the Guard since 2009. She manages a wide variety of wildlife wildlife habitats, and historic and pre-historic resources on Arizona Guard installations including mixed-conifer / pine forests and WWII historic resources at Camp Navajo near Flagstaff and Sonoran desert habitats that housed pre-historic communities at Florence Military Reservation near Phoenix. Janet also serves as the Committee Chair for the NGB Conservation Committee, and has been a member of NMFWA since 2010. Janet received her B.S. (1995) in Wildlife Biology with a minor in Botany from Colorado State University. Before completing her M.S. (2005) in Forestry from Northern Arizona University (NAU), she conducted research on avian ecology and habitat use in California, New Mexico, Colorado, El Salvador, Panama, and Mexico. Janet also worked as a research program coordinator for NAU where she developed and facilitated educational and research partnerships and collaborative projects between the University and public and private landowners. 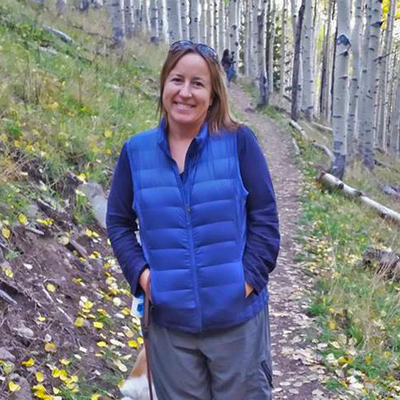 Janet’s interests include wildlife habitat connectivity and climate change, conservation planning, and bridging the gap between research and land management. In her free time, Janet can be found somewhere recreating outdoors, searching out live music, or laughing loudly and often with family and friends.